The Sullivan family has been practicing law in Stephens County and southwest Oklahoma since the 1920's. 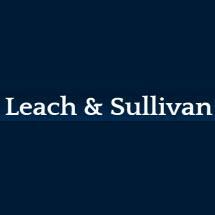 The firm of Leach & Sullivan was founded in 1954 by William O. Leach, Paul D. Sullivan, and Patrick D. Sullivan. The family tradition continued with Michael P. Sullivan joining the firm in 1972 and Kent P. Sullivan joining the firm in 1981. After William O. Leach passed away in 1990, longtime Duncan resident Jay B. Watkins became a partner, after joining the firm in 1987. Currently, the law firm is celebrating 50 years of providing high quality legal services to our community. Our attorneys practice in the areas of real estate, business litigation, business organizations, banking law, personal injury, probate, estate planning, and oil and gas law. We have served our community for generations, and are proud of our well-established reputation in the legal arena and the community at large. We continue to be involved in community activities, such as dispensing pro bono legal advice through Legal Aid, membership in the Kiwanis, work for the United Way, support of local sports teams in Duncan, and donating funds to the Duncan Public Schools Foundation and the Project Graduation lock-in. We cultivate personal relationships with our clients, encouraging them to refer their family and friends to our firm for their continuing legal needs. Indeed, a large proportion of our business comes from referrals and repeat representations of our clients. We are an old-fashioned firm that believes in personal attention to each client's needs, excellent communication, and taking into account our clients' individual situations. We prefer to meet with clients face to face, rather than on the phone, and our clients are on a first name basis with our attorneys and staff. Sooner Trucking & Oil Field Services, Inc.
CMI Strategic Marketing & Promotions, Inc.
Duncan Association of Realtors, Inc.
Southwest Title & Trust Co.